When we observe anything in this world, our perspective is tightly interconnected with our cultural context. As we grow from the egocentrism of childhood to a more expansive view as adults, we may see that not everyone comes from our circumstances, shares our belief system or our way of doing things. At the age of 52, I was a late bloomer in my foray into other cultures. But travel to New Zealand and the Palestinian Territories in 2014, and speaking at the first International Summit on Pediatric Psychosocial Services began a process that continues today. I have learned that “Child Life” has many names and forms across the globe. As I cast a wide net with my blog, trying to see how I can do the most good, it occurred to me that I could use it as a platform for getting out the good word about what people are doing in other countries to make life better for children in and out of hospitals. So every so often, I will choose a country and share the story of a colleague who is holding the torch of kindness to dispel the darkness of fear and pain for sick children. My first spotlight is on Macdonald Doh, my honorary son and a head nurse in the Emergency Department of the Yaounde Gynaeco-Obstetrics and Pediatric Hospital in Cameroon, Africa. I met him at the CLC Summit where he represented his country along with 45 delegates from all over the world. In Cameroon, there is one doctor to every 10,000 people, as compared with 2.4 doctors per 1,000 in the USA. 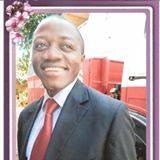 Macdonald is currently pursuing an online diploma in advance ministry and divinity with Christian Leaders Institute. Macdonald is also the founder of the Lamp Foundation, whose mission is to create empowered health professionals; and support one another in faith, clinical practice, leadership, education and research for children, family and community health development. Macdonald’s passion for helping children comes from a deep personal experience with loss and suffering, growing up without a mother and feeling that no home truly belonged to him. He has taken his pain and transformed it into being a healing presence for children in need. He was kind enough to take the time to answer a few of my questions. What brought you to your work with sick children? What has influenced you the most? Can you name three things that you gained from attending the Child Life Council conference and Summit last year? What moved your heart the most? I was marveled at the warm reception given us at the hall facing the river Mississippi. The board members were so warm, welcoming and natural. I felt loved, valued and honored for once in life. During the summit I saw that Child Life was really a movement that had impacted the lives of all the members. I could see everyone passionately involved. I truly asked myself was this natural or just make up scene. The children over there know that some people called Child Life think and care about them. I learned the different types of play, the rule of thumb by Dr. Garry Landreth. I keep quoting him in my discussions at church or at work. Hence there are opportunities for studies over there. What would you like the world to know about your country and the children in your care? Cameroon’s children and youth population is really growing. Can the hospitalized children in Cameroon count on Child Life? Being an inlet into central Africa, we are receiving patients from Central African Republic, Chad, Congo and Gabon. The government is opening a free standing mother and children hospital, Yaounde, Douala very soon and other regions later. Hence there is a focus on children’s health. Child Life activity being present in the pediatric wards will be an indispensable tool to offer equal right of care to all hospitalized patients. When children are sensitized on their health condition and why they are receiving such and such a treatment, they comply easily. I admit that patient teaching is vital to care and effective recovery. Is there one child that stands out in your memory who taught you something invaluable? What did he or she teach you? In the month of March, a girl of about 10, suffering from sickle cell occlusive crisis was admitted in my unit. After several analgesics and anti inflammatory injections (Subcutaneous inj) she grew irritated and repulsive to any nurse. When I visited the ward, I realized the mother sitting by the daughter brought up the complaint. So I took a chair, sat by the bed, discussed with her, touching and gently massaging the painful joints. I asked if I could do her next injection, she complied and said my touch was soothing. She asked me to pray for her while I was injecting her. This was the secret her mother had taught her. This was the first time for a patient to say touches and prayer during injection was soothing. It does not make me more of a hero than other nurses, but thanks to what Child Life taught me last year. What are the favorite games or toys of children in Cameroon? Some wards have bicycles, building blocks, dolls. Thank you, Deb, for sharing such a moving story. Deb this is a great piece, I really like your summary and inclusion of the questions and answers gathered from your experience with Macdonald Doh. It’s really cool that other countries are providing children with improved health care. Progress even if it’s slow is good progress. I’m glad to hear they are working towards a children’s hospital. Looking forward to your next post!